So, I'm walking along Wisconsin Ave on two different days and notice an odd site - a black squirrel. 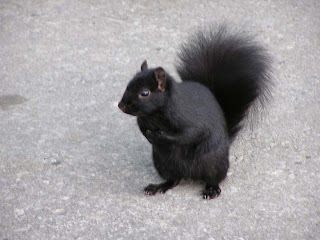 Now, I suppose an albino squirrel would've been even stranger...but this guy was jet black all over. One day, I saw him close to the beginning of my walk. A couple days later...he was dashing fearlessly across the street, avoiding an onslaught of buses and cars. Or perhaps noir squirrels are common here in DC. Two Saturdays ago, I saw my first movie here, Spidey 2. Cool flick. Not a big deal in the scheme of entertainment choices. However, keep in mind that I've taken few breaks while here. Sadly, the theater is across the street from the station. It's hard to believe that a month ago yesterday, I was watching my child being born. A month?! My child?! Yeah, I'm still not used to it…which is easy when one is working away from their child and wife. Kim says that little Georgia is now seeing further. She's following things, looking at herself in the mirror, watching Alley the Cat…which should be entertaining. Yes, Georgia, she's supposed to have that many colors. I'll be returning to Mississippi tomorrow. Finally. It'll be nice to give Kim a break. Although she's had friends and my parents stopping by, she's mostly been alone with Georgia. I'm very proud of her strength and bravery. The three of us will return on Sunday morning and spend Labor Day in ole DC. Kim and Georgia will then be in DC for a week and a half. The house is "on the market" with a sign in the yard. We're on the down slope of our time in Mississippi. Which is kinda sad…but we'll be back.